HEALTH WARNING: This air Pistol fires BBs. Lead and lead compounds are known to the State of California to cause cancer, birth defects and reproductive toxicity. Discharging, handling or cleaning an air Pistol may result in lead exposure. Have adequate ventilation at all times. Do not put BBs in your mouth. Wash hands thoroughly after exposure. GENERAL INFORMATION: This is a air Pistol . It is powered by compressed CO2 in the cylinder located in the grip. Avoid leaving the Pistol with compressed CO2 for extended periods. 3. The Sights on your air Pistol are designed for accuracy. The rear sight is drift adjustable. 4. 5. The CO2 Cylinder is located in the magazine and is used to pressurize the pistol. 7. The BB Loading Pusher located on the front side of the magazine moves back to load BBs and returns by spring pressure upward. (See fig. 7) 8. 9. The Slide Stop is located on the left hand side of the pistol and is used for locking the slide to the rearward position. (See fig. 9) 9. B. Warning: Before you preform this step make sure that if there is a CO2 cylinder in the frame that all the pressure has been released, please wear eye protection during this operation. At the bottom of the magazine you will find a sling swivel. Slowly turn the swivel counter clock wise one turn and move the cylinder to make sure there is no pressure in the cylinder. Then continue to turn the sling swivel until the cylinder holding cup is resting against the bottom of the magazine. (See fig. B) C. If there is a cylinder in the magazine remove it. Now visually inspect the o-ring that is in the gas chamber which is at the top of the magazine, make sure the o-ring is not deformed (if it is replace it). A) Make sure that the air Pistol is pointed in a safe direction and the slide safety is on (firing pin blocked) and your hand and fingers are away from the trigger. B) Remove the magazine if it is not already removed C) Move the BB loading pusher to the bottom of the magazine. Hold the pusher down and load up to 13 BBs in the magazine via the round hole on the front side of the top of the magazine and then release the pusher. (See fig. C) D) Reinsert the magazine until the magazine release locks in place the magazine. FIRING THE AIR PISTOL / RIFLE: After completing the above loading step make sure that the Pistol is pointed at what you intend to shoot then disengauge the slide safety and slowly pull the trigger to the rear. The Pistol will discharge and the BB will be expelled from the barrel. If you wish to fire another BB pull the trigger again until all the BBs have been used up. UNLOADING YOUR AIR PISTOL: IF YOU HAVE LOADED YOUR AIR PISTOL and you wish to unload the pistol. First engage the slide safety, make sure the pistol is pointed in a safe direction and then remove the magazine. Slide the BB Pusher down and turn the magazine up side down and shake all the BBs out of the magazine. Make sure that all BBs have been removed from the magazine and do not reinstall the magazine until you are ready to reload and fire BBs . Caution: Unless absolutely necessary do not shoot a air Pistol without a BB! Never fire damaged or used BBs. Caution: Use only factory new air Pistol BBs. Use only the correct size BBs (.177 / 4.5mm caliber). Do not use steel shot or darts which may damage the Pistol bore and which cause greater re-bound and ricochet. Note: It is a violation of federal law to ship a loaded weapon. CARE AND CLEANING: Caution: Make sure the air Pistol is unloaded before cleaning (follow unloading instructions to insure air Pistol is not loaded) Caution: In lubricating the pistol mechanism, use only a special lubricant with a high flash point designed specifically for use inside of an air compression chamber. (A) Put a few drops of special light oil on the slide and safety. Do not over oil (no more than 3 or 4 drops on each lubrication). The air Pistol chamber should be oiled every 500 Pellets or BBs. Caution: It is better to under lubricate than to over lubricate. Over lubrication will void your warranty. Do not use firearm cleaners or low flash point oils in the air compression chamber and near the vent and breech seal as this will cause dieseling and damage the seal. Caution: Only a competent gun smith should dissemble the Pistol for further cleaning or maintenance. WARNING Altering or modifying parts is dangerous and will void the warranty. This air Pistol was manufactured to perform properly with the original parts as designed. It is your duty to make sure any parts you buy are made for this air Pistol and are installed correctly and that neither the replacements nor originals are altered or changed. Your air Pistol is a complex precision tool with many parts that must relate correctly to other parts in order for proper and safe operation. Putting an air Pistol together wrong or with incorrect or modified parts can result in a damaged air Pistol , serious injury or death to you and others through malfunction. Always have a qualified gunsmith work on your air Pistol or at least check any work not performed by a gunsmith. ALL PARTS ORDERS ARE SUBJECT TO A $10.00 CHARGE FOR SHIPPING AND HANDLING. 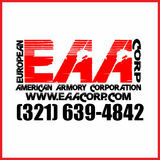 For parts and service contact: European American Armory Corp., 1426 King Street, Cocoa, FL 32922 Phone: (321) 639-4842. STATEMENT OF NON-LIABILITY Air Pistols are not classified as firearms by the U.S. Gun Control Act of 1968. 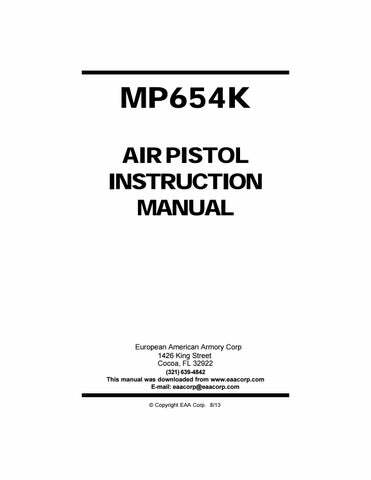 Air Pistols are not generally considered to be weapons; however, they can cause serious injury, death and property damage. Thus, they should be handled with great care. Safety is your responsibility. Neither the manufacturer, nor European American Armory Corporation, assume any responsibility for personal injury, death or property damage resulting from either intentional or accidental discharge or for the function of any air rifle subjected to influences beyond our control. KEEP THIS BOOKLET AND PROOF OF PURCHASE IN A SECURE LOCATION. IZH-654K: Arrangement of Pistol Mechanisms 1. 2. 3. 4. 5. 6. 7. 8. 9. 10. 11. 12. 13. 14. IZH-654K: Valve System 1. 2. 3. 4. 5. 6. 7. 8. 9. 10. 11. 12. 13.